The 2019 Acworth Farmers Market takes place every Friday morning starting in April continuing through the end of October. 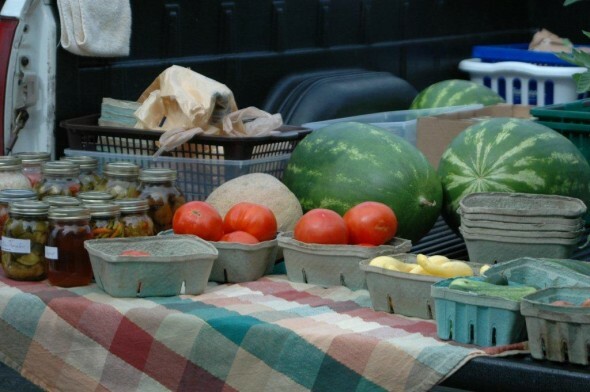 The market is open from 8am to noon and features local produce and products, including fresh fruits and vegetables, plants, jams and jellies, fresh baked goods, cakes, cookies, pies and more. The market is located in Historic Downtown Acworth in the newly expanded Logan Farm Park. 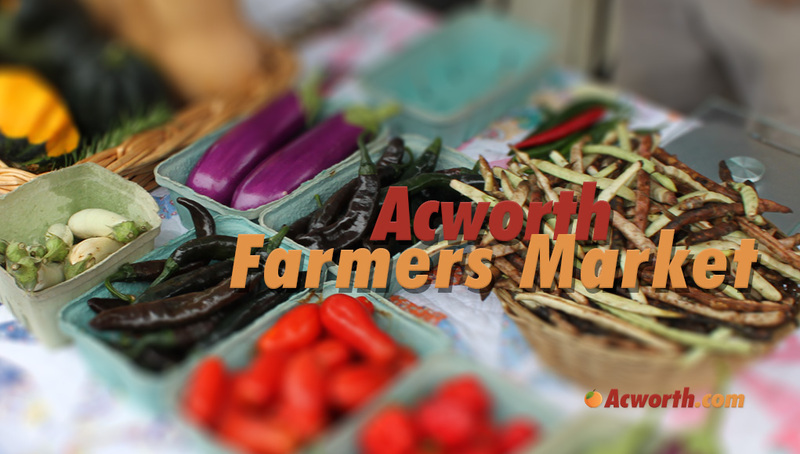 The Farmer’s Market is sponsored by the Acworth Downtown Development Authority. For more information, please call (770) 917-1234.
could you please move to a larger area? Maybe a church parking lot? What is up with having it on a Friday? Most people are in School, or at work. Move it to a weekend day, or even Friday evening. But doing it during the day really doesn’t allow people who would like to go to enjoy it. We drive to Marietta on Saturdays almost every Saturday. Would much rather stay local in Acworth. Who had the brilliant idea of having this on a Friday morning? Did someone not get the memo that Friday is a work/school day? Having this event on a Saturday from 8-Noon or even 9-1 would draw people in to shop for local produce, which my family would certainly like to do, and then people would likely grab some lunch, have a beer, get some ice cream, etc… at the local establishments. Can the sav-a-lot building not be used for a farmers market? One that stays open ALL year? I miss it every weekend because I can’t seem to get there by 11:00a. I think it should at least go to 12:00a or 1:00a. If it can’t due to parking needed for the business establishments then it should be moved to another location. Just wanted to say that I only very recently discovered this & I love that it’s a Friday event! So many things going on on the weekend days already, so it’s nice for my 3 month old & 5 year old to be able to browse around and pick up some fresh veggies/fruits that actually gets them excited to cook & eat. Love this smaller farmers market, and it’s on a Friday so NO LARGE CROWDS. Love IT! Keep it just the way it is. There are plenty of larger farmers markets that operate on Sat/Sun, check out Canton and Woodstocks. Where do you get a Vendor application form ? If you’re not going to change to a larger location, I wish that you’d block off the area so people can’t drive thru. I’ve been hit (not hard, but that’s not the point) three times by careless drivers driving too close to the booths. Please change the day or time. As a previous athens resident I fell in Love with the Athens farmer’s market which was on Wednesday evenings and Saturday Mornings. Please move the time or day of the farmers markets so hard blue collar workers can spend their hard earned money on their local farmers. I had to go to Acworth for something. Saw the sign , but when I got online to check what time it closed. I was sad to see you all closed at 11 and only on Friday. I was going to come back tomorrow morning , but I guess I will have to wait. Sad to I needed to do some food shopping why I waited for my daughter. Please, change the date and time and location!! How many people have to complain before you do something about it??? Not everyone works Monday through Friday folks…. Everyone does not understand that most of these vendors have other places to go Sat/Sun and the city of Acworth has other venues on the weekends. I think it’s awesome they found a niche for Friday. I’m going to try to get there. I work every weekend due to my massage business so the timing and location are great. I agree I love it being on Friday! There are already tons of farmers markets open on Saturday it’s nice to have one on Friday! We are from Michigan and cannot wait to visit! We will actually be in Acworth on the first Friday in May 2017. Yay! We love Farmer’s Market produce! Does it cost anything to attend as a merchant of her goods? This is great! A nice selection of fresh produce, baked goods (strawberry-rhubarb pie!) handmade beauty products and live plants. It was easy to get to and park. I understand it is difficult if you work during the week but whenever you have a Friday off, it’s worth the trip. I had a Friday off from work a few weeks ago and visited the market. Loved it but go to the Square on Saturdays as I rarely have a Friday morning off from work. I think Friday mornings is the perfect day/time! (right before the weekend & not too hot yet) I’m really excited as I have never been yet !!! Born and Raised on a farm in Iowa I have a great appreciation for fresh veggies out of the garden!!!!! I’m curious as to whether you guys sell yellow tomatoes….. they are really hard to find!! I’m hoping!!! See you Friday! I think its awesome and I love Friday am – I realize it doesnt work for everyone but I wanted to leave my positive feedback! Will there be apples this Friday, September 8th? I know Jeamor Farms said he has apples for this Friday but if Merciers is going to be there he will not. We will be coming down for Georgia peaches in June. Are there vendors who offer them at this farmers market? We will be puchasing bushels worth, or should we go elsewhere?